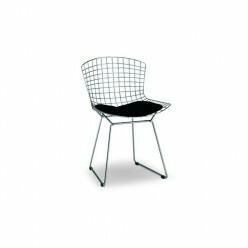 The classic, modern design of this range of seating show the style for which sculptor Harry Bertoia is famed. These chairs remains a fascinating study in bent metal and a fixture of mid-20th Century design that enhances any environment. Available either fully upholstered or with seat pad only. Please note that this hand made item has a five week delivery time.